I have said it before and I will say it again, I totally respect and appreciate the fact that everyone is entitled to their own opinion. Art is pointless without discussion, without debate, without passion, because if everyone constantly agreed on the quality of it then what the hell is the point? So by no means am I telling anyone they are wrong or that their thoughts are invalid when I say the following: I can't comprehend the negativity that has surrounded The Hunger Games: Mockingjay Part 1, at least on a critical level. Some may see the "fresh" overall ranking on a site on Rottentomatoes and wonder what negativity I am referring to, but if you take a closer look at many of the reviews posted, there seems to be this consistent rhetoric regarding this film being a lazy cash grab and many seem to find it boring. The general idea behind the cash grab notion is because of the decision to split the final novel into two films where as they were able to make well paced and compelling single films out of the first two, and I will be totally honest, prior to seeing Mockingjay Part 1, I had assumed I would be bothered by this exact thing. I read all the Hunger Games novels prior to me seeing any of the films, and I recall being a tad underwhelmed by Mockingjay after being thrilled by every damn page of Catching Fire. When the announcement came that the final piece of the source material would be split apart, I rolled my eyes and assumed the worst because I didn't believe the first half of Mockingjay was worthy of being its own film, but I gotta tell ya...I was wrong. Was the pacing of Mockingjay Part 1 perfect? No, a little bit of fat could have been trimmed off the edges for sure. There may have been a scene or two that could have found their way to the cutting room floor without harming the narrative, although to be honest at this moment I couldn't tell you what I would have cut myself. Without a doubt though, this film didn't flow quite as wonderfully as its predecessor Catching Fire did, but regardless the decision to make two films was absolutely the correct one. Knowing what is yet to come when the conclusion of this franchise arrives next year, there is simply far too much content worthy of finding its way to the screen for them to have made an audience friendly 150 minute or less feature without rushing through the material. I'm glad they chose to let the environment, the dialogue and the stakes of the revolution breathe. Being bored is such a subjective response to a film because one man's trash is another man's treasure. I was fascinated by the back and forth war taking place during Mockingjay Part 1, and I don't mean merely bullets and bombs but also the trade off of political propaganda in attempts to sway the momentum of the movement. The footage used to rally the districts, the coaching of words to incite the highest amount of passion, all of it was well written and totally compelling, and I found that the film pretty much flew by and I never once felt fatigued by the progression of the story nor did I want it to end. 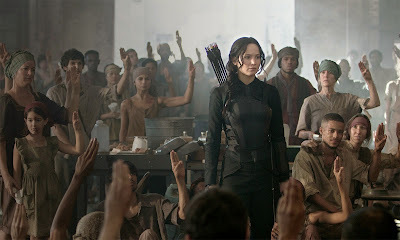 Director Francis Lawrence had already proven to me that he was the right choice to helm the remainder of the Hunger Games franchise after I fell in love with Catching Fire, and that opinion was reinforced with his confident and smart direction on display here. The imagery on display throughout balances the modern and crisp essence of 21st century filmmaking with the gritty and dour vibe of the setting and mood wonderfully. The performances were yet again on point, and the talent on display with the usual suspects from the previous installments combined with additions like Julianne Moore and Natalie Dormer made it impossible not to find the dialogue interesting. Oh, and Philip Seymour Hoffman...if he were my professor in school, regardless of the subject matter, I would have gotten an A. When he spoke, I listened, and while I usually don't dwell on the loss of actors for too long, it is still surreal to know he is gone and the days of seeing him absolutely own a frame are soon drawing to a close. 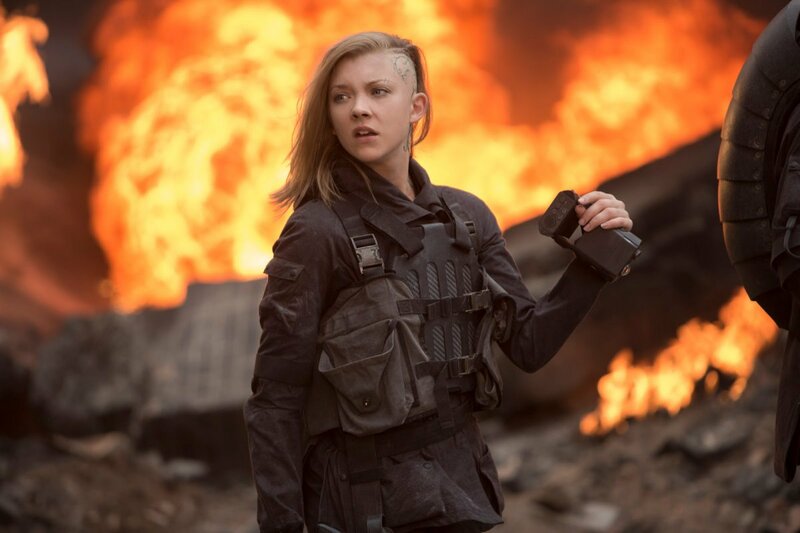 I have a feeling that the reception to The Hunger Games: Mockingjay Part 1 is going to change drastically once the final film is released, when it becomes apparent that the somewhat methodical pace of the first act was actually a perfect lead in to the chaos and tragedy that rears its ugly head during part two. This may not end up making a top ten, top twenty, hell who knows, maybe even a top thirty list from me once I screen everything I desire to from 2014, but the only thing that matters right now just keeps dancing through my head: I can't wait to see the final chapter unfold. I agree they did a decent job of not making Mocking Jay Part I too boring and I didn't want it to end, but part of that was also because I wanted to action to start! I still disagree with the decision to split this into 2 movies and I believe it could have been done in 1 and still kept it under 3 hours. Just cut all those scenes of Katniss outside with Gale. Yawn! I know what you are saying, and I agree some of that stuff could have easily been cut. I just worry that rushing through the story in, say, 160 minutes may not be ideal compared to taking their time with it. In the end, the decision to make two films was certainly a financial one by the studio and no doubt they could have made it one, but I entered the theater very concerned about the first half being uneventful and I was surprisingly compelled throughout. Thanks for the thoughts Anna, appreciate it!